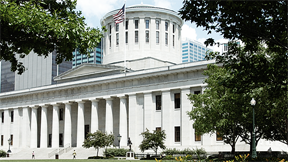 The newly constructed Ohio Statehouse Museum, which opened to the public on June 10, will function as an interactive place for learning about Ohio government for more than 90,000 Ohio Statehouse tour visitors annually. The opening celebration includes a short ribbon-cutting ceremony on the ground floor. The Ohio Statehouse Museum includes interactive, hands-on exhibits that will challenge visitors' knowledge about Ohio history and the workings of state government, while equipping them to more fully participate as citizens. Historical artifacts and images will tell the stories of those who designed and built the Statehouse and those who have come to serve. Audiovisual media transports visitors to historical events and invites them to imagine themselves as governor or a legislator. The opening of Phase II of the Ohio Statehouse Museum creates nearly 5,000 square feet of updated exhibits on the ground floor of the Ohio Statehouse that will enrich the experience of school children and visitors.